NaCl is the four-letter chemical recipe for salt, a mineral that is an essential component of human nutrition. A chemical compound of one ion of sodium (Na) and one of chlorine (Cl), salt is absolutely essential for animal life, though it can be harmful when consumed to excess. The table salt (also called halite) that most of us consume daily originates, at varying degrees of remove, in the world's seas, where the concentration of this compound is what makes sea water "salt water." Some salt comes from large underground mines, in areas which once were seas. Other salt is harvest directly from evaporated sea water. 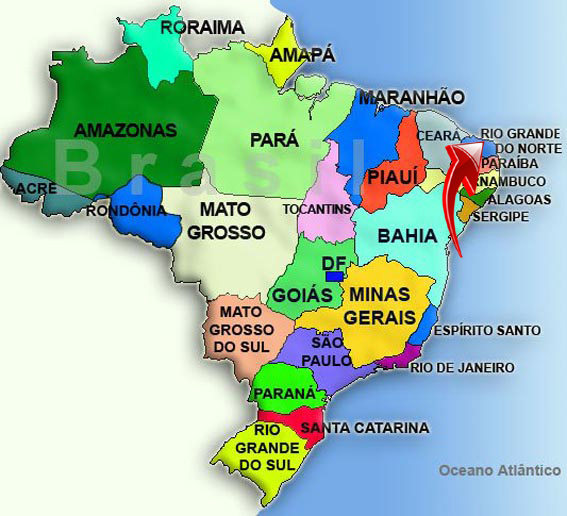 In Brazil, most of the salt consumed is obtained by this second method, and the large majority of it comes from the northeastern Brazilian state of Rio Grande do Norte. What makes this small state such an important producer of salt? It's a combination of location and climate. Rio Grande do Norte sits on the western shore of the tropical South Atlantic Ocean, so there's plenty of the basic material of salt - salt water. And Rio Grande do Norte's climate, which for most of the year is hot, cloudlessly sunny and reliably windy makes for rapid and efficient evaporation of sea water. As they say in Rio Grande do Norte, salt practically makes itself here. Most of the salt harvested in the region, whether for industrial use or for human consumption, is made by pumping salt water into large pools (called salinas in Portuguese) up to two meters deep and exposing it to the constant sun and wind, waiting for the water to evaporate and leave only the salt behind. The mineral is then harvesting and refining into the type of salt required by its intended use. Until recently, in Brazil, salt intended for human consumption was refined for purity, then packaged and sold without differentiation or variety. 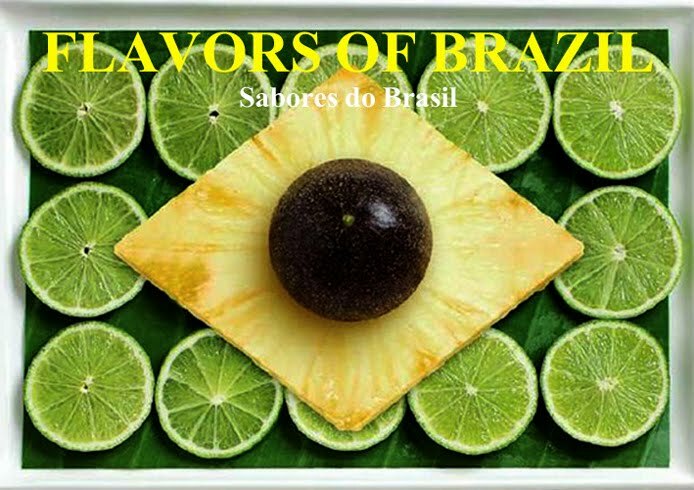 But in Brazil, as in the rest of the world, in the past decade or so humans have begun to show an interest in unrefined or natural salts, in salts that reflect regional differentiations, and in salts with different crystalline formation. One of the most popular of these "gastronomic" salts is called fleur du sel, a French term meaning "flower of salt", though in Brazil is it translated into Portuguese as flor de sal. Although imported French fleur du sel has been available for quite a few years in gastronomic emporia in Brazil's big cities, it's only been in the past four years, since 2008, that domestic Brazilian flor de sal has become available, and it's only now that it's becoming widely available. All of that flor de sal comes from Rio Grande do Norte. The term fleur du sel refers to a specific crystalline formation of salt, one that has a characteristic lightness and crunch and one that is suitable for garnishing a dish at the last minute or for a dish in which the cook wants only a part of the dish to be salty. The technique of making fleur du sel originated in Brittany, in France as much as a millennium ago, and it is this ancient technique which today produces Brazil's own flor de sal. Water is pumped into a series of pools, and as it evaporates, it is moved from pool to pool, becoming more concentrated with each step. When the water finally becomes a super-concentrated brine, and only under perfect climatic conditions of abundant sun, heat and wind, a fine web of hollow salt crystals forms on the surface of the brine and can be cafeully scooped from the surface. This is flor de sal. Formed of fragile, hollow, light crystals, flor de sal is pure salt in its most delicate natural form. The hollowness of the crystals is what gives flor de sal its typical crunch and what differentiates it from garden-variety salt. Making flor de sal is difficult, hot, backbreaking work, and it depends on perfect weather conditions - if there isn't enough wind, or there are passing clouds, the crystals won't form on the surface of the water. So in Brazil, as elsewhere, flor de sal is significantly more expensive than table salt. However, since production commenced four years ago, Brazilian consumer acceptance of flor de sal has grown every year, and today there are three firms producing it in Rio Grande do Norte and selling it throughout the country. Today the market is purely domestic, but there are plans to increase production and develop the export market for Brazilian flor de sal. The potential for growth in this industry is enormous, as Rio Grande do Norte is blessed with all the ingredients for making flor de sal. Some other locations, such as the world's large deserts, have plenty of sun and wind - it's the water they are lacking. Others, like Pacific Islands, have all the salt water they can handle, but are too cloudy or humid for the crystals to form. When it comes to flor de sal, Rio Grande do Norte, apparently, has it all. With material translated and adapted from Paladar, Estado do S. Paulo newspaper.